Andy and Alan, two names that will stick in my mind for a long time. I met Andy in October at the Halocross in Dalkeith, after racing to the race, racing the race as good as I can, and racing back to see my girlfriend. In between we had a chat over a coffee, as Andy raced me at the race. We were both on singlespeed bikes; we had something in common. And we had a beer. Now I am standing in front of a steep assembly of rocks and grass, and can only guess what is behind the other side. 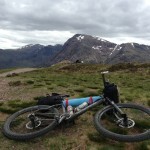 For a moment I curse myself, the race, the bike, the mountains, Scotland. Then I look back. I have passed two Bealachs today already after almost falling asleep on a long stretch of road. I did know that anything called Bealach on the road means trouble, would I have known what to expect of the ones offroad, I would have never made it to the start. Although the last thing I want to do now is turning around and admitting defeat. As there is no way back, the only way is up. Giving up more than half way through? No chance! I remember when Alan replied to my email to enter the race in November, days after I met Andy. ‘I hope you know how hard this ride is!’ was Alan’s first reply to me. 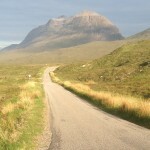 A ride through the Highlands at the end of May? With the security of a spot tracker on my bike. Hard? I take the bags off the bike and make my way up. I slip, try to hold my balance. At least I make slow progress up the path. I forgot how light the bike is without luggage strapped to it, at least one advantage of doing this race singlespeed. It doesn’t matter how sophisticated gearing will ever get, in this terrain all you can do is to carry your bike uphill, no matter how fancy your bike is. I turn around. The bags have disappeared in a deep valley, with dark clouds looming above it. In between the sun lights up the scenery and makes it look dramatic. In this very moment I wish I had chosen a less dramatic race. At 12.06am on Sunday morning I cross the finish line in Tyndrum. 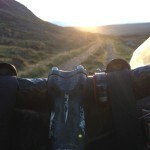 Spotting two lights down the path I near the car and can see Sophie, my girlfriend, hiding from relentless midges. I get off the bike, give her a kiss and hug her, and chuck the bike straight in the car. For the moment that’s it, no more riding. Seven days, 15 hours and six minutes after the start I have finished what to me can easily be graded as one of the hardest mountain bike races in the world. 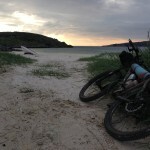 I am shattered, exhausted and glad to be off the bike. Trying to make it, comfortable before the cut off, I have also just finished the longest day in the race, longer than 100 miles. Starting early in Glen Affric Hostel, I started racing along the shore of Loch Affric, basking in beautiful sunshine. 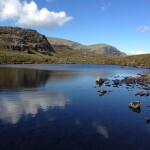 If there is a great way to experience some of the most scenic and most dramatic places in Scotland in a week, it is undoubtedly the Highland Trail 550. If you are after relaxed travelling, comfort and a ‘normal’ holiday, scrap the idea straight away. And never think of anything like this again. Every inch progress in this race must be earned, and some inches are incredibly hard to earn. And then there are the midges, and the bog. The sun is shining, a beautiful morning. I have to stop, look down my front tyre and discover it’s almost flat. 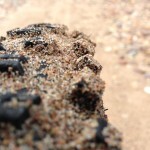 So far I have been incredibly lucky, or maybe picked the right tyres for what was to come. Nobby Nics, a great choice for former military roads, roots, stretches of road, mixed with diamond black-graded sections, slippery grass sections, but most of all, bog. By the end of the ride my feet are black, my skin is broken and itchy. The bog is so aggressive that my skin hurts for days after I finish the race. I stop, turn the bike on its head and take the wheel off. Five seconds later I am surrounded by midges. I am next to a river; there is not the slightest breeze and I am in the middle of the Scottish Highlands. If you would pick any place to fix a puncture, this would be your last choice. I swear to myself. I could have exercised more care when packing the bags in the morning, as both spare tyre and midge net are buried in the middle of the front bag. I try to empty its contents as quick as possibly, pull the knee warmers down to cover my legs, and promise myself to set a new record fixing a puncture. I don’t brake any record, I use a pump I never used before. And suffer. I leave the midge net on and pedal on. No stopping anymore unless I can be fully convinced there are no midges. I fold up another page and stick it behind the other maps. There are only nine A4 sheets left to go through. Some of them will take longer to get through, some of them shorter. With every piece I fold, I come closer to the finish line. The printed maps save my race half-way through, while I loose my GPS on the shores of Loch Maree. 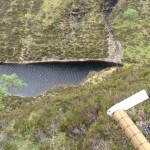 I am devastated, having finished a really rough section from Poolewe to the shores of Loch Maree. 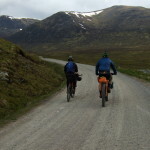 Just about to hit the road and crank the final two hours to a nice hostel in Torridon I discover that the bar mount is empty. Another three and a half hours walking later, I still have no GPS, but lost valuable time at a very crucial point of the race. I ditch myself in a shelter next to the street and try to sleep. I barely sleep on the bed of gravel, in hut smaller than the average garden shed. The more the night progresses, the more stones are pinching my skin. Cutting down a £3 sleeping mat to three quarters of its size only gives you limited comfort. ‘One more Mars bar and another cup of coffee please!’ I mumble. There is no juice left in my body. I smell, look tired. At least there is a pub now. I almost crashed on the last few metres, almost falling asleep on the bike. Any more miles on the road would have ended in the ditch. The waitress in the pub puts a smile on her face: ‘50p please. Refills are on us!’ I thank her and stumble outside. She just made my day. I go back for another and add a can of Coke to the bill. The stretch ahead of me is more unknown country, and I desperately need to keep myself awake. Mentally I collapsed this morning already, no sleep, no coffee, absolutely nothing left in my body. While sipping the coffee I remind myself of day two of the race. ‘Hey Markus!’ I can see Rich in the door of the Strathpeffer Hotel. ‘Shall I order you food? They stop serving in 5 minutes’. Rich looked tough, tougher than me. I had overlooked him at the start. Rigid bike, Belgian race socks, cotton cycling cap. 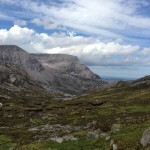 We had set off together in the morning, after I collapsed on the couch of Melgarve Bothy, at the bottom of the Corrieyarick Pass. I bumped into Rich again near Loch ma Stac, both looking for a way through bog and mist. We had both made it through a ford, which could have easily ended the race there and then. The rapid was so strong that it almost ripped my front wheel away. Somewhere on the way Rich passed me. Staying with Rich at Strathpeffer reminds me of what I had classed for me as the toughest race I had ever done. 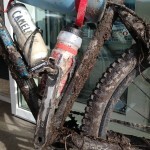 While cleaning the multiple layers of dirt from my bags and breaking the shower, I think of Strathpuffer. 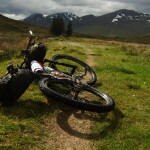 I think about riding Strathpuffer for a week. On the finish line I have a clearer idea: Think about riding Strathpuffer for a full week and you get an idea what the Highland Trail 550 is about. ‘Which ones?’ I reply. ‘Highland 550 or whatever it is called?’. ‘Yes, I am.’ ‘Want a bucket of water and a cloth as well, maybe that will help?’ ‘It’s just the pads, again, but sure mate, a drop of water might help to rinse the bog off.’ His wife comes out and we continue chatting while I fight off the midges, one by one. I pack the bags and say thanks. As cruel as the race is, it is one of the best things I have ever done in my life. Three months later I find myself chatting to Henning Wehn, a well-known German comedian who has just endured a full run at the Edinburgh Fringe. This is the moment when I again realize how much of an adventure the Highland Trail 550 has been. You can define a great adventure by the amount of good stories you can tell afterwards. I have to stop as the bar closes. 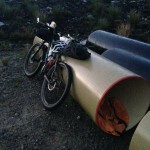 The Highland Trail 550 stories would have easily provided enough material to chat until the next morning. Big thanks, in no particular order, to Sophie, for being an ace girlfriend, Dougie for fixing things I can’t fix, Harald, for kindly borrowing me the bags for the trip, all my family, and all colleagues at Scottish Swimming, that tracked my progress and gave me a round of applause when I went back to work. Andy for telling me about the race, without that helpful bit of advice I would have never written that story. Bike: Cube LTD, dating back from 2003 I think, singlespeed conversion with an old Deore LX derailleur, Surly/KMC steel drivetrain, Deore cranks, Hope BB, Race Face bars and stem, Ritchey post, Spech saddle – overall: nothing fancy. and possibly many more things! I am from Australia and am considering coming over and doing this route (but not as part of the race). I am wondering where you were able to get more detailed track notes? Or if you made some? I will have many questions for you. do you have to complete a certain distance each day to reach a suitable campsite? are there places to camp if you are unable to complete the full section for that day? How often is there drinking water available? How much water did you carry with you at a time?